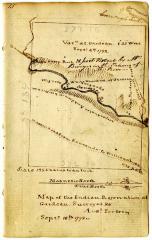 Hand drawn map from a field book of the Holland Land Company's lands in the western part of New York State. Survey of land on two sides of the Genesee River with several notations about the terrain and the location of a waggon road from Kaueaude to Williamsburgh old path. Scale of 125 chains to an inch.